But, while all of these [various morally relative assessments of the Viking Age] are entirely valid perspectives, the pendulum may have swung too far: as one modern historian puts it, the revisionist view has come close to giving us an image of the Vikings as a group of ‘long-haired tourists who roughed up the locals a bit.’ Among the aims of this book is to restore the violence to the Viking Age, and to try to show why our understanding is incomplete without it. 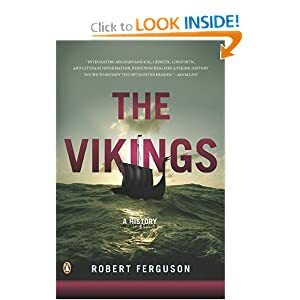 I’ve already referred to Robert Ferguson’s The Vikings: A History twice on this blog, here and here, having found it an informative and instructive book. If I’d been disappointed or offended, I’d have more to say. As it is, I’ll offer a short review of quite a good general history of the Viking Age. Why a new history of the Vikings? Because we keep learning stuff. You’ve got to run to keep pace with our knowledge of the early middle ages nowadays. People like me, especially, who take it upon ourselves to lecture on the subject, need to take the initiative to keep our reading up. I thought what I learned about the Oseberg ship, linked above, was worth the price in itself. Author Ferguson makes the considerable contribution of including something I’ve written about here before, and which was perhaps introduced in English-language history books by my friend Prof. Torgrim Titlestad, in a work that didn’t get the attention it should have – the new (actually old) theory that the Viking raids were initially sparked by Charlemagne’s brutalities against the Saxons. Having shared that useful idea, Ferguson does little more with it, which I think is appropriate. It seems to me that, even if the original spark was religious, the Viking raids continued for plain reasons of profit. There are no images of peace-loving, put-upon Viking victims here, and that suits me just fine. Ferguson spends what seems to me adequate time, within the limits of a single (if long) volume, following the activities of the Norse through all their major fields of activity around the world, and through the three centuries of that activity. I caught one or two small errors of fact, ones I knew to be fact, but that’s inevitable in a work of this scope. Highly recommended for all who are interested in the subject, and especially for curious newcomers. 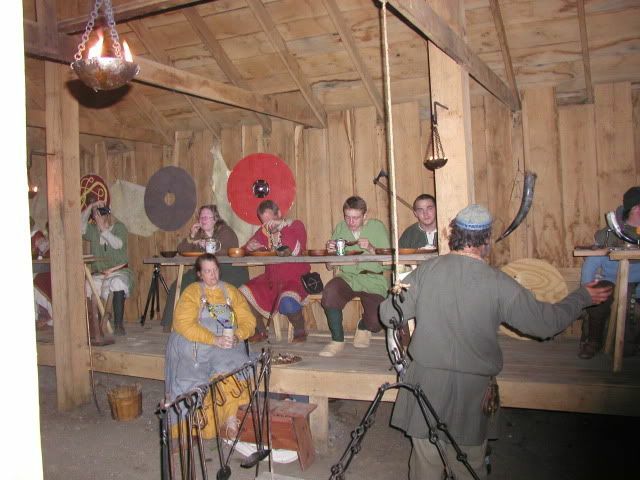 Vikings feast at Ravensborg, Knox City, Mo. I’ve already savaged the History Channel Vikings TV series in this space, but I have something new to say about it today. I think I may have found the source of one of its (many) errors. Watching the two episodes I endured, I got the impression that the script writers had blocked out their story first of all, based on their preconceptions of what Viking life was like, and then went hunting through history books for authentic details to sprinkle around, sometimes without any understanding of context. One of the many moments I disliked in the series was when, on the eve of a voyage, the Vikings brought out a ceremonial bowl of water and passed it around, splashing it on their faces and blowing their noses into it, as a sort of corporate team building exercise. I knew where this idea came from – the 921 AD account of Norsemen in Russia by the Muslim diplomat Ibn Fadlan (whose account formed the basis for Michael Crichton’s novel Eaters of the Dead, on which the movie The Thirteenth Warrior was based). Ibn Fadlan describes, with palpable disgust, how the Viking company washed up this way in the morning. There’s no suggestion of any greater purpose; it’s just the northerners’ culturally inferior standard of hygiene. With the Volga flowing by outside, the economy would seem unnecessary. Perhaps some bonding ritual was involved that reinforced the group identity and strengthened its internal loyalty. It would appear that Ferguson’s book was one of the sources the TV writers skimmed, and they grabbed up this bit of speculation as just the kind of gross-out detail they were looking for. But Ferguson doesn’t footnote the sentence. It’s just a guess. My own guess, based on a conversation with author Michael Z. Williamson, who’s a Middle East war veteran and has some familiarity with Islamic customs, is that what offended Ibn Fadlan was simply the fact that the Norsemen washed in still water in a bowl. Under Islamic law, true washing always requires running water. Still water is unclean. Even if the thralls refilled the bowl for each man, it would still be a pollution in Ibn Fadlan’s eyes. He was also, in the opinion of most historians, not beyond exaggerating from time to time.